NEW YORK (TheStreet) -- For long-term investors living through The Great Contradiction, at least there's a bright side. Dividend-paying growth stocks continue to perform remarkably well. I could not be happier with several of the dividend stocks I own. 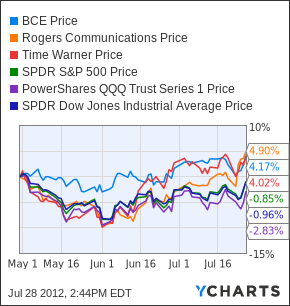 A significant chunk of my portfolio sits in media and telecommunication giants Rogers Communications ( RCI - Get Report), BCE ( BCE - Get Report) and Time Warner ( TWX. Each stock experienced a recent swoon. All three dips preceded excellent buying opportunities. Couple market-beating returns with dividend yields from 2.7% (TWX) to 4.0% (RCI) to 5.1% (BCE) and you have ideal core stocks for a volatile, low-interest rate environment. But it doesn't stop there. When you buy stocks like TWX, RCI and BCE, you're not just allocating investment to some savings account alternative. You're buying three cash-flush and multi-billion dollar powerhouses well-positioned to realize long-term potential that's absolutely not priced into the stock. 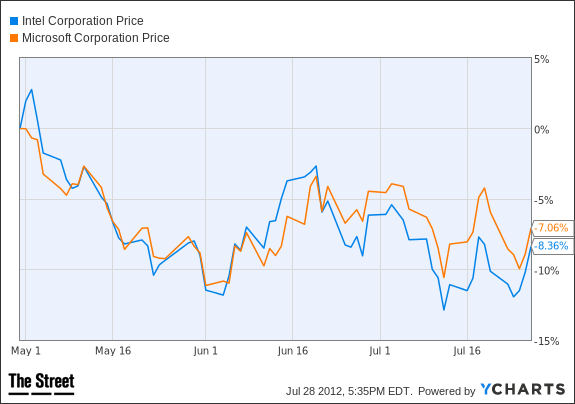 While I love to speculate a bit more aggressively, I am also on the hunt for more of these relatively "safe" stocks. While there's no such thing as a safe stock market bet, compared to more speculative names, sturdy dividend payers offer a smaller degree of risk. I expect to have at least some sort of a position in TWX, RCI and BCE for the foreseeable future. They represent three buys that I add to several times a month. I continue to look for dividend-paying stocks with similar attributes. That process triggered several interesting stocks -- four that I am already long and another five that I can get long via an ETF that I used to own (sung to the tune of Gotye's "Somebody That I Used to Know"). 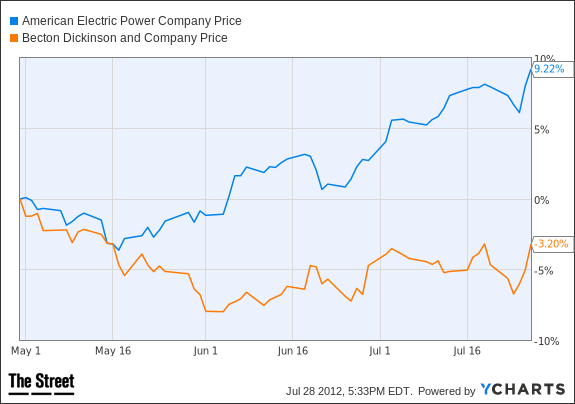 I use Dividend Reinvestment Plans (DRIPs) to stay consistently long American Electric Power ( AEP - Get Report) and Becton, Dickinson and Company ( BDX - Get Report). AEP tanked a bit earlier in the year on regulatory uncertainty in one of its largest markets, Ohio. After hitting lows in April, the stock has recovered by roughly 14%. Management cut AEP's dividend in 2003. They have increased it, however, every year but one since 2005 to its present $1.88 level. It looks stable. I just got into BDX's DRIP on some weakness during the end of May. Here's another stock that's not all that exciting, but it pays a dividend that has a long history -- longer than AEP's -- of going up. I write a check to each stock's DRIP every month alongside an automatic monthly investment and then forget that I own them. Investors continue to underestimate the growth opportunity both of these stocks present. You certainly do not buy them for the dividend, though it's nice. You buy them for their strong competitive positions and aggressive future plans. My article history on TheStreet contains more than a few bullish discussions of Intel and Microsoft's potential. So much of it, of course, hinges on the success of ultrabooks and Windows 8 during the holiday shopping season as well as each company's push into the mobile space. Focusing on Microsoft, I find it funny that several media outlets made a big deal out of something the company included in the risk factors section of its most recent annual report ( via the SEC): "In addition, our Surface devices will compete with products made by our OEM partners, which may affect their commitment to our platform." That amounts to boilerplate because really, unless Apple ( AAPL decides to open up its operating system, Microsoft has practically nothing to worry about. I guess Google ( GOOG could turn Android into a Windows 8 competitor in the PC market, just as Microsoft looks to make the latter a serious foe to the former in the mobile space. But that's not a transition that will take place overnight. As it stands, what is a Dell ( DELL or Hewlett Packard ( HPQ laptop, for example, worth without Windows, particularly Windows 8? Not much. To that end, I hope the Office for iPad rumors are just that; it makes no sense to deliver one of your prime competitive advantages -- a piece of software that ties so many to your platform - to Apple. It was a different ballgame when Microsoft did it on the desktop. This is mobile and Microsoft plays the role of underdog. If there's ever going to be a crash, I expect a soft landing in the Canadian housing market. After incredible increases in price, Vancouver is down considerably. Canada's biggest city, Toronto (I will be there for a couple of days in early August), looks like it could move along a similar path. Actual number of sales in both places has tapered off. Major differences exist, however, between the Canadian and American housing markets. First, the banks have and continue to lend, relative to what we saw here in prior to the 2008 crash, responsibly. Canada also continues to tighten mortgage regulations in anticipation of weakness. Simply put, they're doing something we never did -- acting prudently to begin with and properly preparing for a soft landing in a housing market than really cannot continue to go up. 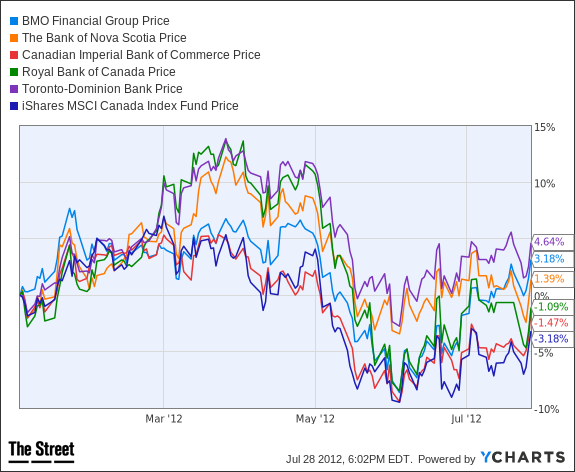 I bailed from the iShares MSCI Canada Index ETF ( EWC earlier this year shortly after it started to tank. It might be time, however, to jump back in. It represents a straightforward way to get considerable exposure to Canadian banks. As of Friday's close, RY, TD and BNS make up EWC's top three holdings at 6.22, 6.02 and 4.79% of net assets, respectively. BMO is 7th at 3.14% and CM is 13th at 2.46%. And, being a Canadian ETF, you hedge your best with several strong utility and natural resource plays not to mention RCI and BCE with exposure right around 1% of net assets apiece. At the time of publication, the author was long AEP, BCE, BDX, INTC, MSFT and RCI.